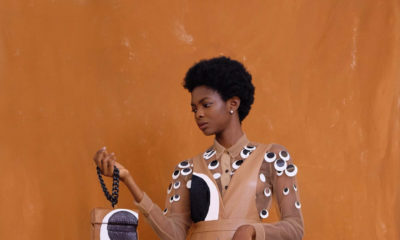 Fresh off a Vogue UK feature, Cameroonian label Maison D’Afie has released its Fall 2016/2017 look book campaign and everything from the clothes to the photo retouching and poses scream frail, fragile and ‘Do Not Touch’. Aptly named Tiki (meaning precious in the designer’s native Douala dialect), the designs are largely made up of shift dresses in mid century silhouettes, contrasting maroon/bordeaux and sage/mint tones with accents of child-like motifs stitched in colourful lines and shapes that are also complemented in iridescent appliques. Bene. Beautifully made. Wearable. Artistic. i had to go back and read. i’d assumed it was an oyinbo fashion house. interesting point, Amaa. 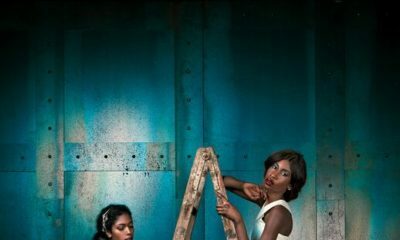 i agree with Amaa but with a different focus, on the product and not on the model. the model is just marketing, saying black or white can wear this. i feel it’s more important to make a unique, true-to-you product, and then sell it on global markets if necessary. … and i sort of feel many times we copy out of a misplaced sense of awe – when there is so much to be awed about in our local environment if we only pay attention. a very fine collection, very fine. not everyone will have the same approach to design or the business of fashion. Awwwwwww I love all of it?????????????????????????????????????????????????????????????????? I love every piece. The designs are beautiful and cohesive. These pieces can actually compete in the western market. Congratulations to the designer!!! omo! are you seeing what i’m seeing? Really nice and wearable clothes.